Rhythm Strip Management (RSM) takes rhythm-strip data in PDF format from the Philips Information Center (PIIC and PIIC iX) and automatically transfers the rhythm strips to the EMR as unsolicited HL7 results. This is an elegant solution for the end user.RSM solves a number of problems for a hospital’s rhythm strip management workflow. 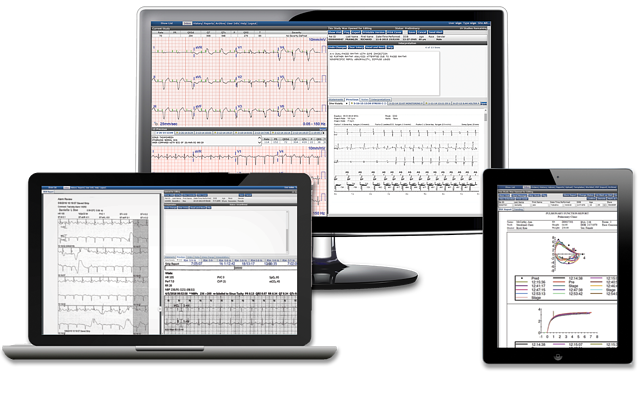 Cardio Server is a multi-modality, vendor-neutral ECG management application. Cardio Server is compatible with over 260 devices from 80 different device manufacturers and imports data from 23 diagnostic modalities. Our application communicates with all major EHRs, consolidating multiple device interfaces into one, cost-effective integration. Discover why Epiphany is the preferred provider when managing multi-modality diagnostic test data. Pulmonary Server allows users to access, view, edit, and electronically sign pulmonary studies and other diagnostic test data from anywhere in the hospital, office, or home. Epiphany supports all leading PFT manufacturer's devices. Epiphany can also provide you access to other study information such as previous pulmonary results, stress, sleep, EEG, ECG. Pulmonary Server collects diagnostic test results from 23 modality types.